The rubber plant (Ficus elastica) is a popular ornamental plant from the Ficus genus. In it's natural habitat it grows over 30 metres tall, however, the varieties grown indoors are a much more manageable height. For the indoor grower looking for a tree type plant species with attractive foliage which can grow from 1ft to over 8ft tall, this is an excellent choice. 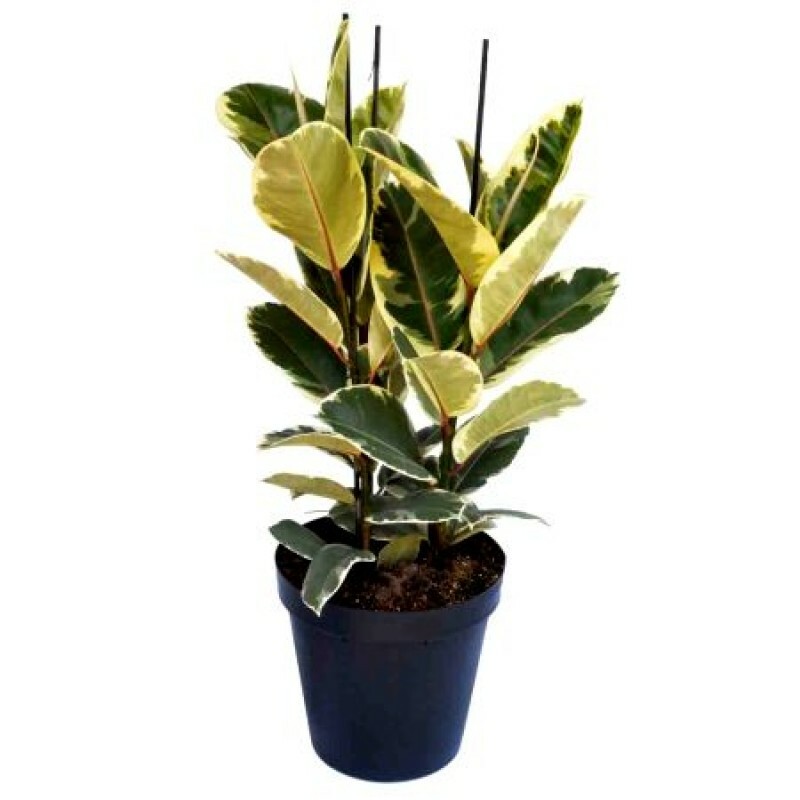 There are a number of Ficus elastica varieties grown successfully indoors which includes, "the most common one" F.elastica decora (has shiny leather type leaves which grow to a foot long), F.elastica robusta (has larger leaves than decora), F.elastica black prince or burgundy (has near black reddish leaves) and a selection of variegated types. How it looks and displaying: The rubber plant is all about having a small tree indoors with broad shiny attractive leaves. When this plant is about 1 - 2ft tall it's well suited sitting as a centrepiece on a table, on a shelf, or on a windowsill, but once it begins to grow above 3ft it looks great standing next to a fireplace, television area or near door entrances (as longs as their are no cold drafts). I prefer the decora which has plain green leaves, but others like other leaf color variations and there is a nice choice. Once the plant begins to mature and grow in height it's common to train and support the trunk and branches by staking or tying them back to keep them growing upright. Care level: This species is quite an easy plant to care for and can grow well on low light. The worst a grower can do (which are common mistakes) is over-water, move the plant around too much or to a spot with less light or with colder temperatures. Sudden drops of temperature or cold drafts are also not good. Temperature: Average room temperatures of 60 - 75°F (15 - 24°C are fine. Avoid lower than 55°F (12°C), sudden temperature drops and cold drafts. Light: A nice brightly lit spot is ideal, without direct sunlight. Watering: Water once the soil becomes slightly dry to the touch and make sure the pot has sufficient drainage holes to allow excess water to seep through. The worst thing you can do regarding watering is "give it too much". Soil: A well-draining and well-aerated potting soil is needed. 1 part peat, 1 part pine bark and 1 part coarse sand (or perlite) is a good mix. Fertilizer: Feed during spring and summer with a diluted liquid fertilizer. Re-Potting: From May - June re-pot once the roots have become pot bound or every year when the plants are very young, and then once every 3 years after the plant has matured. I would renew the soil every year. Propagation: These can be quite tricky to propagate by stem tip cuttings, but you can succeed. Take a cutting (few inches long) and allow the sap to dry for 1 hour. Before potting the cutting in soil use rooting hormone and then provide the bottom of the pot some heat (usually using a heat pad). The temperature wants to be kept at around 70°F (21°C) - 75°F (24°C) ideally.